The meeting didn’t start well. I had travelled to Geneva to meet with a Procter & Gamble executive and he had forgotten about our meeting. My goal for the meeting was to try avoid a battle between standards for wireless charging of mobile phones. It was November 2011 and P&G had recently announced a joint venture with Powermat to market “small charging mats and receivers that wirelessly juice up cell phones and other small electronics”. The joint venture announced that it would use Powermat’s proprietary wireless charging technology. The year before, in August 2010, the Wireless Power Consortium (an open industry group with 100 member-companies at that time) had announced its standard for wireless charging, called “Qi”, and the first Qi-compliant products had arrived on the market later that year in September. My assertion to P&G was that their joint venture would be better off making their products Qi-compatible. By adding Qi to Powermat products, the competition would shift from ‘between technologies’, to ‘between products’ , and Duracell would be able to harness capabilities in which it excels: creating differentiated products for the right price, supported by a strong brand and a worldwide distribution network. Risk of disappointing market growth. Competition between incompatible products will lower the sales of the whole product category because key stakeholders will wait until it is clear which technology wins. Such a standards battle will shift the adoption curve 1-2 years into the future. Risk of patent holdup. In a patent holdup, the patent owner obtains a court order to block sales of infringing products. The settlement is usually expensive. The rules of the Wireless Power Consortium protect the members against such a holdup by other members. By adding Qi to their product, they would reduce that risk significantly. Risk of losing the standards battle. By avoiding a standards battle, they would avoid the risk that the complete investment will have to be written off. “The Wireless Power Consortium is not advertising Qi to consumers and your members are not advertising wireless charging. I will be more interested when I see serious commitment by the Wireless Power Consortium to advertise wireless charging”. The first observation was correct – the Wireless Power Consortium didn’t spend much on promoting the Qi standard. The second observation was not correct. The rules of the Wireless Power Consortium don’t require sharing of differentiating features with competitors. He was probably confused with the licensing rules for open source software. Anyway, the concern about differentiation was probably not his main concern. The P&G executive seemed convinced that market leadership would be achieved by the brand that spent most on consumer advertising. He was not interested. The opportunity to avoid a standards battle between Powermat and the Wireless Power Consortium was lost. Powermat and P&G went on to invest in advertising the Powermat wireless chargers. They contracted Jay-Z as the face of their advertisement campaign and installed wireless chargers in Madison Square Garden in 2012. Fast forward to October 2017, and the market share of Powermat-compatible mobile phone chargers is negligible. On the basis of best sellers ranking on Amazon.com, I estimate their market share is below 1%. The rest, more than 99%, is Qi-compatible in a fast growing market that shipped 53 million wireless chargers in 2015 according to IHS. The Wireless Power Consortium and Powermat chose two very different strategies. The Wireless Power Consortium followed the classic model used in consumer electronics standards such as DVD, USB and Bluetooth. In this classic model, standards are developed by an industry consortium in which competitors work together with the goal to make their products compatible. Powermat on the other hand, aimed to establish a proprietary de facto standard. Control over the standard was kept exclusively with Powermat and business partners of Powermat, such as Procter & Gamble. Proprietary de facto standards can be highly profitable. Look, for example, at PayPal’s online payment system or Sirius XM satellite radio. Why did Powermat’s attempt to establish a proprietary de facto standard for wireless charging fail? 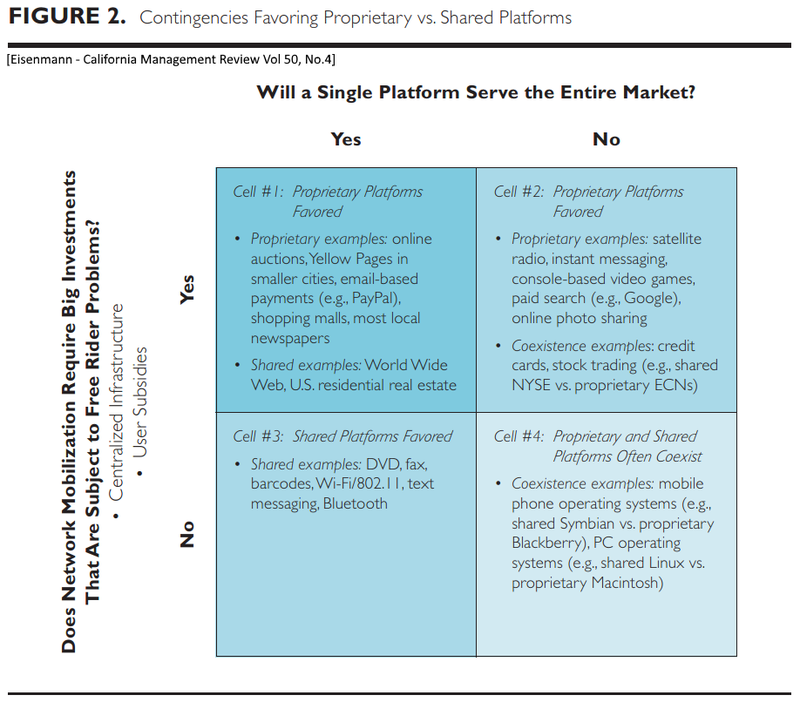 The article “Managing Proprietary and Shared Platforms”, published by Thomas Eisenmann in the California Management Review (Vol. 50, No 4), provides a useful framework for analyzing the two strategies. For this analysis I will use the terminology used by Eisenmann. Platform The set of rules and infrastructure that allow users to interact with each other. Eisenmann calls this a “platform”. The electronics industry uses the term “standard” or, more accurately, “interface standard”. Qi is a platform. The Powermat technology is also platform. Two-sided platform A platform with two distinct user groups. DVD, for example, is a two-sided platform: The movie industry publishes movies on DVD discs, and the consumer electronics industry sells DVD players that play the discs. Wireless power standards are also a two-sided platform, with mobile phone manufacturers on one side and on the other side the home charger manufacturers, car manufacturers, and hospitality service providers (hotels and restaurants). Proprietary platform A platform controlled by a single company, or by a group of business partners. Shared platform A platform controlled by a group of companies. To qualify as a shared platform, the controlling group must include competitors. Network The group of users of the platform. Network effect Interactions with a platform are subject to a “network effect” when the value of using the platform increases with the number of users. Free-rider A company that benefits from interacting with the platform but doesn’t contribute to the development or promotion of the platform. b) Companies that use the platform to make products or offer services. Investments, the free rider problem and the penguin problem. A shared platform, such as the Qi wireless charging standard, is not capable of making big investments in consumer advertising because companies that use the standard are reluctant to pay for advertisements that will also benefit companies that have not paid. This “free rider problem” is the main handicap of shared platforms. Powermat, on the other hand, did invest in advertising to promote its wireless charging system. From 2012 onwards, Powermat and its business partners also invested in the installation of wireless chargers in Starbucks locations, with the goal to create a world-wide public infrastructure for wireless charging. In the meantime, the Qi platform gained market share on both sides of the platform. Nokia launched the first mobile phones with integrated wireless power receiver in 2012. Between 2010 and 2016, hundreds of different wireless chargers and wireless power receivers were launched. Looking back, it’s clear that network mobilization (=adoption of the standard) did not depend on big investments. The marketing investments made by Powermat and Procter & Gamble did not have any significant effect on the adoption of the Powermat technology. Similarly, the investment in deploying wireless chargers in Starbucks stores had no effect either. So, why did these massive investments fail? In my view, these advertisement campaigns had little impact because the products did not meet user’s expectations. Powermat could initially charge a mobile phone only via a special phone cover or dongle. That is not a convincing advantage compared with plugging in a charging cable. The user experience is much better when the wireless charging capability is integrated in the phone. I would argue that their investment in advertising came a couple of years to early. The investment in deploying wireless chargers in Starbucks stores had little impact because only a small percentage of the 10,000 Starbucks stores in the USA were fitted with wireless chargers. Installing wireless chargers in a store is expensive because the furniture must be adapted to fit the chargers and electric wiring must be adapted to power the chargers. The massive investment required to install wireless chargers in all US Starbucks locations only makes sense when the majority of store visitors have a mobile phone that can charge wirelessly, but at the time of the roll-out only a small percentage of visitors used the chargers. It would have been better to wait with the investment until enough visitors carry a phone that can charge wirelessly. Qi products were predominantly aimed at the consumer home market. It helps that this is the place where people charge most. It is also easier to be profitable in the home market because the penguin problem is far less problematic for home chargers. Consumer who purchase a phone with wireless charger will immediately benefit from using the wireless charger at home. Massive investments in infrastructure are not need to create value for consumers and are not needed to be profitable. Even today, wireless phone chargers are used mostly at home, in the office, and while driving a vehicle. And these markets are served almost exclusively by Qi chargers. A contributing factor was the low maturity of wireless power technology in 2010. Several companies experimented with wireless phone chargers in 2000-2010. Ericsson, Motorola, Nokia, NXP, Palm, Philips, Sanyo, and Visteon (to name a few that I am aware of), had internal research projects and some brought products to market with limited success. The basic technology (magnetic induction) is well understood, but it was very difficult to make the product safe, efficient, and easy to use. The first Qi products as well as the first Powermat products had many issues. The innovation in Qi products, however, was much faster than the innovation in Powermat products. Fierce competition between companies in the ecosystem forced them to innovate, differentiate their products, and reduce the cost of components. It is easier to justify R&D investments in a shared platform compared with contributing to a proprietary platform. The risk/reward ratio is perceived to be better. The combined investment in R&D for Qi products, counting all investments by members of the Wireless Power Consortium, was significantly higher than Powermat’s R&D budget. Early adopters of a technology have a large variety of special needs. Many companies served these small niches with Qi products, and that helped drive up volume without requiring massive investment in advertising. Eisenmann remarks “Unlike infrastructure and user subsidies, R&D spending typically does not engender severe free-rider problems for shared platform providers.” It is not surprising, therefore, that the Qi platform is strong in rapid innovation. By the time the market size became significant, around 2013-2014, Qi products were thinner, lower cost, more efficient, and had more advanced safety features such as improved methods to detect and prevent heating of metal objects. Finally, the network effect was a significant contributing factor. Eisenmann captures that effect with the question “Will a single platform serve the entire market?”. Interfaces between electronics products tend to have network effects. That means that the value of supporting an interface increases with the number of other products that support that interface. When the network effect is strong, a single interface will dominate when the market matures. Eisenmann calls that “Winner-Takes-All Dynamics”. How strong is the Winner-Takes-All Dynamics for wireless phone charging? 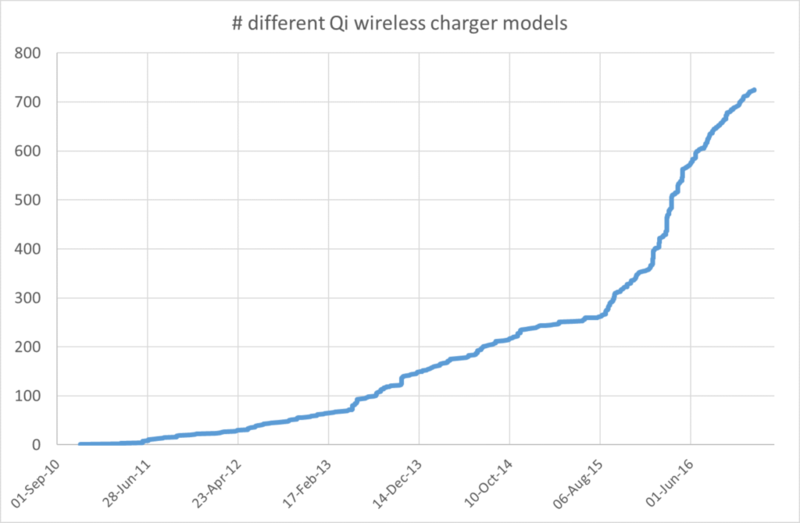 The 2017 market share in wireless mobile phone chargers (less than 1% Powermat, more than 99% Qi) suggests that the effect is strong. Proprietary platforms are disadvantaged when Winner-Takes-All Dynamics are strong because companies that need to invest in developing products for a proprietary platform will fear hold-up and aggressive price increases when the proprietary platform wins and achieves a monopoly. The risk of hold-up is low for shared platforms, making that a safer bet. An obvious consequence of Winner-Takes-All Dynamics is that the loser loses all. Shared platforms provide relative safety against losing it all. Proprietary platform are considered a high risk, although with high reward. Eisenmann writes “Most managers and entrepreneurs are risk averse, so they are not likely to find this gamble appealing”. The Procter & Gamble executive I spoke with in November 2011 didn’t seem concerned about that risk. At that time he saw a market where market share would be determined by the level of investment in advertising and his competitors looked unprepared to match Procter & Gamble. 2006/11 Visteon demonstrates a wireless phone charger for use in vehicles. 2008/12 Wireless Power Consortium founded. 2009 Powermat launches their first wireless charging products. 2010/08 The Wireless Power Consortium releases the Qi specification for wireless charging. 2013/09 The organization of German automotive engineers (CE4A) announces that it recommends that its members use the Qi standard in current and future vehicle models. 2014/11 Starbucks begins national roll-out of Powermat wireless charging in San Francisco. 2015/03 Samsung announces the Galaxy S6 smartphone. This phone supports both Qi and Powermat wireless charging standards. 2015/03 Samsung announces their wireless chargers. These chargers support Qi only, they don’t support the Powermat technology. 2015/12 According to IHS, The wireless charging transmitter market more than doubled in 2015, as 53 million transmitter units shipped globally. The market share of Powermat compatible chargers is probably less than 1% (own estimate based on best sellers ranking on Amazon.com). 2016 Starbucks stops the roll-out of Powermat chargers in their stores (own observation). 2017/09 Powermat announces it will upgrade its public charging pads to support the Qi standard.